An old country phrase best describes the possibility of a turnout increase saving Sen. Thad Cochran (R-MS) in an upcoming runoff: That dog don’t hunt. But it’s also far from clear whether a bigger turnout would naturally help Cochran in the runoff anyway. Mississippi Republicans voted at record levels in the regular primary, and that of course wasn’t enough to push the incumbent over 50%. As to the first point, turnout generally falls in runoffs held after primary and general elections –significantly. Table 1 shows the turnout changes in Senate primary runoffs held since 1980. In nearly every case, turnout decreased from the regular primary to the runoff. Notes: Florida abolished its runoff system in 2001; since 1989, candidates have only needed to win at least a 40% plurality in North Carolina to avoid a runoff; due to its blanket primary system, Louisiana results are not included. To view this table as a PDF, click here. Most states don’t have runoffs, and the lion’s share of the ones that do (11 total) are located in the South, a relic from the days of one-party dominance, where winning the Democratic primary was once tantamount to election. The last time turnout actually increased in a Senate primary runoff was 30 years ago in the Oklahoma primary, when two Republicans battled for the right to advance to a general election that Sen. David Boren (D-OK) ultimately won with more than 75% of the vote. All told, turnout for the regular primary in these 40 races was about 20.7 million. In those same races, only about 13.9 million showed up for the succeeding runoff. That’s a drop of nearly a third (-32.6%). It would be a considerable historical anomaly for more voters to show up for the Mississippi Republican runoff than the primary, and what makes it even more unlikely is that Democratic voters who voted in the Democratic primary are forbidden from voting in the GOP runoff. As we’ll show below, Cochran handily defeated his opponent, state Sen. Chris McDaniel (R), in Mississippi’s Democratic areas, so this rule probably hurts the incumbent more than the challenger. Given the significant interest in the Mississippi race — it attracted the biggest Republican primary turnout ever in the state, higher even than the 2012 presidential primary — it seems reasonable to expect that a drop in turnout would be lower than the average, perhaps akin to the roughly 20% dropoff rates in two recent, high-profile Southern Senate runoffs: The 2010 Democratic runoff in Arkansas (won by former Sen. Blanche Lincoln) and the 2012 Republican runoff in Texas (won by Sen. Ted Cruz). Turnout was 313,000, but McDaniel finished with 49.5% of the vote to Cochran’s 49.0%. Table 2 shows Mississippi’s 82 counties listed in order of the change in Republican primary turnout from 2012 to 2014. McDaniel counties are in green, and Cochran counties are in yellow. Notes: Counties won by McDaniel are shaded in green, counties won by Cochran are in yellow. States are listed in order of the change in GOP primary turnout from 2012 to 2014. To view this table as a PDF, click here. Sources: Politico, Dave Leip’s Atlas of U.S. Presidential Elections, the U.S. Census Bureau and Crystal Ball research. There was actually a very slight negative relationship between increased turnout and support for McDaniel. The correlation between the two variables was R = -.04, meaning that a given county’s comparative increase or decrease in voter turnout from 2012 to 2014 essentially told us nothing about how much it supported McDaniel or, by extension, Cochran. While there wasn’t a statewide connection between increased turnout and McDaniel’s performance level, his home county and those surrounding it really delivered for him. Only three other (and much smaller) counties increased their turnout more than Jones County, which McDaniel represents in the state Senate. Turnout there was up 50% over the 2012 GOP primary. McDaniel not only romped in his home county, but his supporters also came out in force in the surrounding counties: Turnout increased by more than the statewide average in eight of the 10 counties, and McDaniel won each one. Taken together, the 10 counties cast 31% more votes in 2014 than they did in 2012. However, a glance at the results shows that McDaniel suffered from poor turnout in other places. One of the counties where turnout fell off the most from 2012 was DeSoto County, which is part of greater Memphis in the Mississippi-Arkansas-Tennessee tri-state area. McDaniel dominated there, winning 62.9% of the vote, but turnout decreased 14% from 2012. This might be a place for him to target in the June 24 runoff. Another big county that saw a steep drop in turnout was Lee (Tupelo), a northeastern county that some observers thought was a positive bellwether for Cochran early in the night last week (Cochran got 56.8% there). There’s room for the vote to grow in both places. The two counties with the biggest burst in turnout, Coahoma and Sharkey, both went heavily for Cochran. Unfortunately for him, they only cast 0.4% of the statewide vote total. While there wasn’t a connection between turnout growth and the performance of either candidate, there was a moderate relationship between the percentage of a county’s population that is African American and its support level for McDaniel — the correlation between that pair of variables was R = -.48. Of course, the stark racial divide in voting habits in the Magnolia State meant that many counties with very large black populations had only a scattering of votes in the GOP primary. Nonetheless, of the 38 counties with populations that are at least 40% African American, Cochran won 30 of them. Beyond that, Cochran also won 26 of the 31 counties that voted for President Obama in 2012. The two basically split the counties won by Mitt Romney in 2012, with McDaniel winning 25 and Cochran winning 26. McDaniel only won 30 of 82 counties overall, but obviously that was enough to finish ahead of Cochran in the first round of voting. Coincidentally — or perhaps not — when Ronald Reagan beat Jimmy Carter by two points in Mississippi in 1980, Reagan won about the same number of counties as McDaniel did in this primary (31 of 82, with a Carter/Reagan tie in another county). Prior to Reagan’s election, Mississippi had given its electoral votes to the Republican presidential nominee only twice since Reconstruction (1964 and 1972). It hasn’t voted for a Democratic presidential nominee since. Map 1 compares Reagan’s performance in the 1980 presidential election versus McDaniel’s performance in the primary. On the map on the left, Reagan is in blue — repeat, blue, not red — while Carter is in red. On the map on the right, Cochran is in red and McDaniel is in green. Note: Reagan and Carter tied in Clarke County, which is why it appears with red and blue stripes. Sources: Reagan/Carter 1980 map from Dave Leip’s Atlas of U.S. Presidential Elections. McDaniel/Cochran 2014 map is from The New York Times. While the Reagan and McDaniel maps don’t line up perfectly, both candidates showed similar strength in the southeastern part of the state. 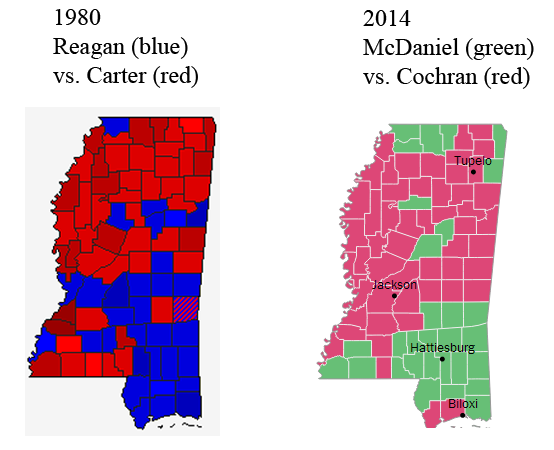 That area helped power the Reagan Revolution 34 years ago, and if McDaniel wins on June 24, the region will have once again powered a conservative revolution, albeit of another kind: kicking out Cochran for an avowedly more conservative replacement.